When I was a child (just a few years ago) our Thanksgiving Turkeys were smoked. Please understand that in 1965 a smoked turkey was quite the novelty – folks just didn’t have the array of smokers they have today! My father ran a welding shop and one of the products that he produced to sell was a grill made from a 55 gallon drum. These were horizontal and stood on 4 legs rather than upright like many drum smokers today. “F.L.” had rigged his own with a seemingly antiquated rotisserie motor for cooking turkeys. It was a marvelous cooking machine over which my father was the master! Now, in reflection, I’m guessing that the man didn’t own a meat thermometer. I tell you that to say that he sometimes had a well flavored but dry product coming out of his cooker. However, the family and neighbors loved them and he was a Thanksgiving legend in northwest Albany, GA. Demand was so intense that he ultimately designed and built a double prong link to allow two turkeys to take a spin on the same rod. 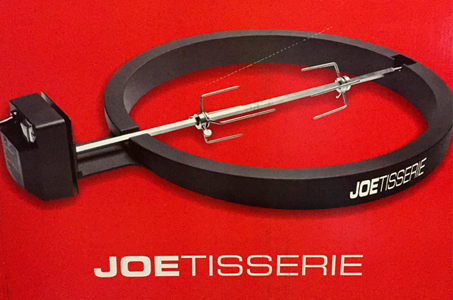 When I saw the Komado Joe Joetisserie I was filled with tasty memories. There was no doubt that I would have one – especially since it fits so well on the large BGE. I was really anxious to see it hold a nice-sized turkey and hear the little motor hum with hopes that it would sound somewhat like my Dad’s old gem. Thanks to the wonder of Amazon I owned one about a week prior to Thanksgiving. We were hosting a Thanksgiving dinner with two other families at our house so there just was no room for a less than stellar bird for our celebration. A test-bird was required. 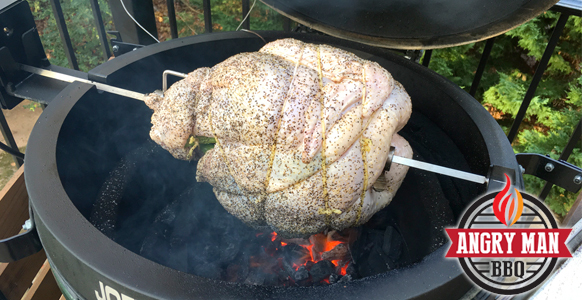 I’m not one to make things complicated that really ought to be simple and that seems to be the case with smoking a turkey on the BGE. I’m amused, even amazed, by the many FaceBook posts and forum rants on how to make smoking a turkey as complicated as completing tax forms. Brine, no brine, spices, inject, slow cook, fast cook, spatchcock, cook whole, top up or bottom up – it gets overwhelming! I like Butterball Turkeys! The price on Butterballs is usually reasonable near Thanksgiving and they have cooking directions right on the package. They are seemingly always moist and just easy to cook. I went to the local grocery and bought one to test. The only real addition to the basic instructions on the package and their website is that I had to run the rotisserie bar through the bird & attach the stabilizing brackets. That prep included some trussing with string to keep turkey appendages from flopping around as the bird turned over and over and over. After tucking a few stalks of celery in the cavity I gave my turkeys a good rubdown with olive oil then a dusting with kosher salt and coarse pepper – that’s all. Sorry to disappoint those that think it should be complicated, I know that probably gets your boxers bunched. I did wrestle with the thought of an indirect cook. The TurboStream would have been a prefect way to make this one indirect. But, F.L. cooked his direct so I decided to yield to my turkey smoking heritage. I poured in lump to about the top of the firebox and sloped it up toward the sides with a depression in the middle. I like to use Traeger pellets scattered in the lump for a good smoke – so I mixed in a small amount of hickory for some flavor. My father believed hickory was the only wood for smoking meat. Butterball suggest roasting at 325° so that was my target temp for the BGE. At that my 9 pound turkey would cook in 2 ½ to 3 hours. 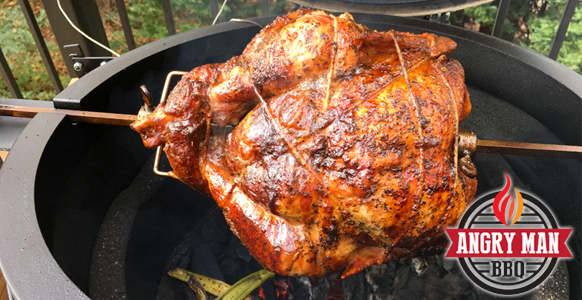 So, with the BGE settled in there I put the bird in the rotisserie and started it turning. The rotisserie makes it totally impossible to use a constant reading wired thermo-probe so I began checking temp at just over 2 hours into the cook. It ran quickly and was up to temp (180 thigh & 165 in breast) right at the 2 ½ hour mark. We gave our bird a foil tent for a good rest when it came off the BGE. 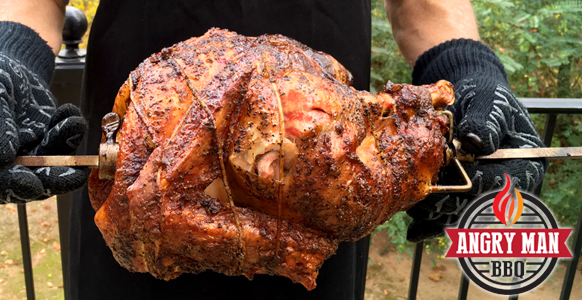 It carved up beautifully and was moist and delicious – just as a Butterball Turkey should be. With the “test turkey” and then actual Thanksgiving turkey a few days later I’ve got 2 great cooks in the book. We will spin one again – it’s a great way to cook a tender, juicy turkey. 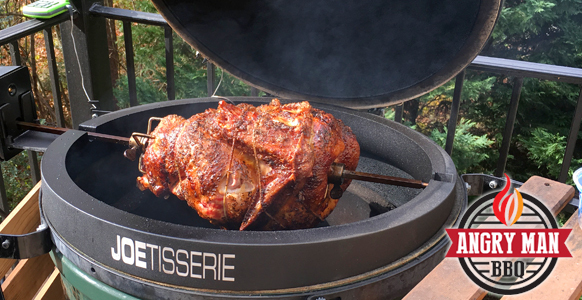 The Joetisserie is a great addition to the BGE. It performed flawlessly and even more quietly than I would have liked. I’m looking forward to rotisserie cooking beyond turkeys – but just turkey makes it worth the price for me.